Accurate light measurement on the move thanks to a professional pocket light meter (Wavego) powered by your smartphone. 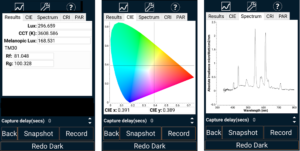 Turn your phone into a pocket light meter which can measure Lux, melanotic lux, CRI (all colours from R1 to R15), TM30, PAR, MacAdam eEllipses, absolute irradiance spectrum and CIE 1931 coordinates. Accuracy is just 3 nm. On the move, you measure, view, save and share your light measurements with your mobile (iPhone, Android). Take single or continuous measurements with GPS tagging in one click. Then, let the free light meter app calculates all the essential metrics for quantifying light and connects the data to a user account via the cloud. Advantage of a spectrometer over a lux meter? Accuracy: a spectrometer can measure over the entire visible range of light, and in small intervals (the resolution), the data output is far more reliable than a single measurement taken by a lux meter.